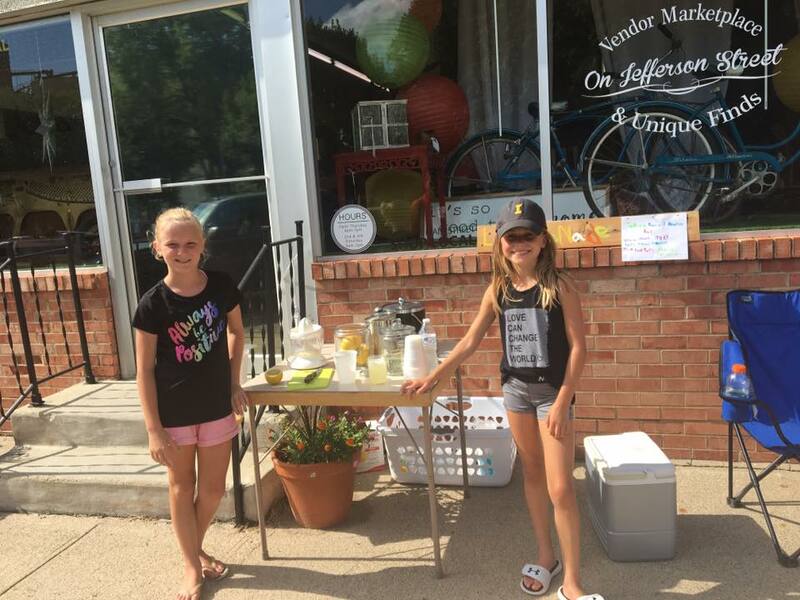 Thank you to Alyssa Grier for the blog post below about Kenna’s Lemonade Stand! What a fun & unique way to raise money for several great causes close to her heart! It all started in June of 2014. Kenna, our then five-year-old daughter, wanted to set up a lemonade stand. It was a cool night when she tossed out the idea and I suggested to her that it might be a little too chilly and late in the evening to sell lemonade. She then went into our kitchen, opened the fridge and found another entrepreneurial venture. This time, string cheese and I couldn’t really say no to that so she spent the next half hour set up just outside our front door yelling “Cheese sticks, five cents! Get your cheese sticks!” Her two customers that night thought she sold pretty good cheese and made a good salesperson but then again we were pretty biased as her parents. I posted on Facebook about her cheese venture as a way to remember the moment and was told that if only she would have had a better marketer on her team she would have sold out. Her grandparents thought they were pretty hungry for some cheese if only they would have known sooner! When July came around and the weather turned warmer, she was determined to make lemonade so her marketing team went to work. Some posts were made on Facebook to inform and round up customers, and then a recipe was perfected for the lemonade. By chance, we had just found an electric juicer for sale at a garage sale for $2 and decided that it would be fun to make fresh squeezed, hand shaken lemonade for the stand. She also decided it would be really fun to donate all the money to a good cause and she picked the PCM Food Pantry. The first stand and all it’s generous customers raised $75. The summer of 2015 came and having another stand was on the top of Kenna’s summer to-do-list so she set up shop again. This time she wanted to collect donations for the Cystic Fibrosis Foundation as she had just learned of the disease and wanted to help those with it. A teammate on her softball team that summer had/has cystic fibrosis and we also had just recently learned of several other children within our community who were fighting for a cure of the same disease. Kenna, along with several other neighborhood kids, squeezed lemons, added sugar, water and ice and collected $250 that year. Another summer came and Kenna was begging to have another stand. It quickly became her favorite summer tradition. In 2016, we had learned more about an organization, Sharing the Weight. With it having a connection back to Prairie City and our family and friends, she knew right away that it would be a great organization to collect donations for through lemonade sales and, with the help of her great grandpa, she also sold handmade, hand painted birdhouses. The birdhouses and drinks brought in $330 for Sharing the Weight. 2017 came and Kenna realized it would be her fourth year of having a lemonade stand so she decided she wanted to set a goal to raise $400 and she also wanted the help of her four grandmas to do that. She asked each grandma if they would help her do some baking. She realized that the extra product of birdhouses the year before made for more money and decided she wanted to sell cookies as well as lemonade. All donations would go to Help-A-Heart in honor of a local boy who has battled a congenital heart defect from birth and had undergone an extensive surgery that year. Over $400 was raised, cookies were sold out and priceless memories were made with very special grandmas. Thanks for all you do through Help-A-Heart! 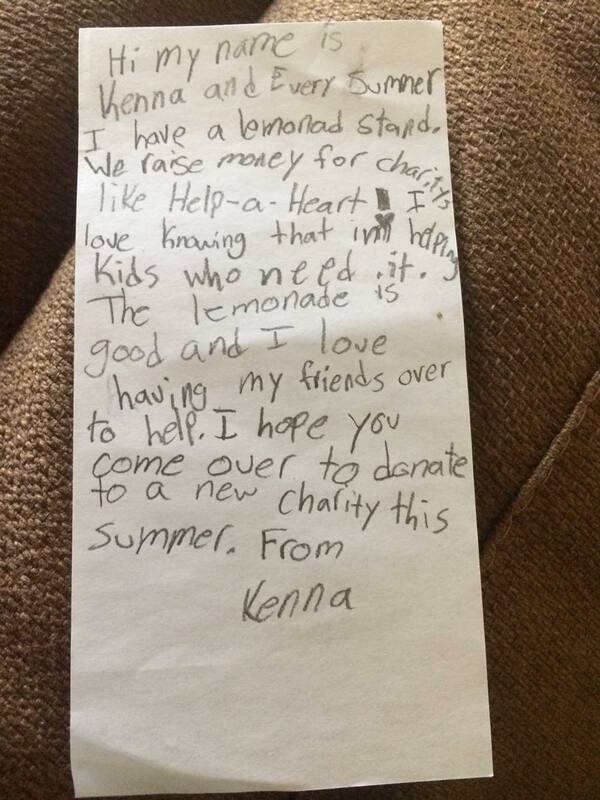 We are so happy that Kenna’s Lemonade Stand can help in a little way.